T-Up’s D-Aspartic Acid is scientifically proven to raise testosterone in healthy males! It also has vitamins that enhance the key ingredient’s effectiveness. T-Up's D-Aspartic Acid is scientifically proven to raise testosterone! T-UP® Mega Testosterone Booster is raising the bar in natural testosterone elevation by bringing you scientifically researched D-Aspartic Acid in a clinical amount. Unlike many products that claim to support natural testosterone, our effects are real and supported by a clinical study. In this clinical study, the D-Aspartic Acid used in T-Up led to an average 42% increase in testosterone after only 12 days of use. An elevation in testosterone levels is associated with more muscle gains, strength increases and enhanced recovery. Just one serving a day is needed! Most testosterone boosters use ingredients that have only been tested on mice and it makes you wonder how so many companies can say their ingredients are clinically tested. But Nutrex T-Up is different. 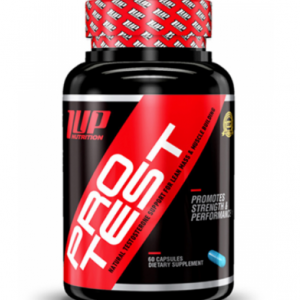 It has D-aspartic acid; a powerful, proven testosterone-boosting ingredient. It also has vitamins that enhance the key ingredient’s effectiveness. Directions: Take 4 capsules once per day between meals. Only one serving per day is needed. We suggest taking this product for 60 days. Use daily for best results.